NOVEMBER 24, 2017 - PHILADELPHIA, PA – OurVetSuccess today announced award of its 2017 Veterans Professional Development Scholarship to Raul Sanchez, a former infantry soldier in the U.S. Army’s 82nd Airborne Division. Sanchez completed three combat deployments to Iraq and Afghanistan in Operation Iraqi Freedom and Operation Enduring Freedom. Since his discharge from the Army, Sanchez has gone on to build his profession in comedy arts. "I'm very honored to receive the OVS scholarship," Sanchez said. "I hope to bring credit to other veterans through the hard work and dedication I place in my craft." Sanchez has performed in venues from Texas to Montreal to New York, and released an album of his work in 2016, I'm Funnier Than This, which is available for purchase on iTunes. 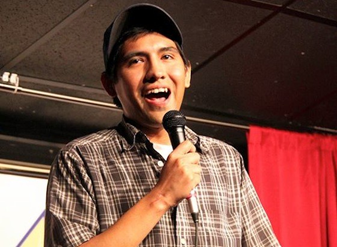 The winner of the 2013 Funniest Comic in Texas award, Sanchez has amassed an ardent fan following of his signature, family-friendly humor, having earned more than 9.5 million views of his work on Facebook. Born in Anahuac, Mexico, Sanchez became a naturalized U.S. citizen in 2006 after completing military service. The San Antonio, Texas native currently resides in New York. ABOUT OURVETSUCCESS: OVS is a Philadelphia-based company that creates television, digital content and experiences, that showcase the lives and work of successful veterans. More info at www.ourvetsuccess.com Media inquiries: call OurVetSuccess at (215) 680-6004. U.S. Army 82nd Airborne veteran-turned-comic, Raul Sanchez.